Protect walls, equipment and machines from accidental damage in warehouses, parking lots, and work areas. 8 Net steel safety bollards provide a solid layer barrier between moving hazards and locations requiring protection designed to stop a vehicle and reduce damage to structures. 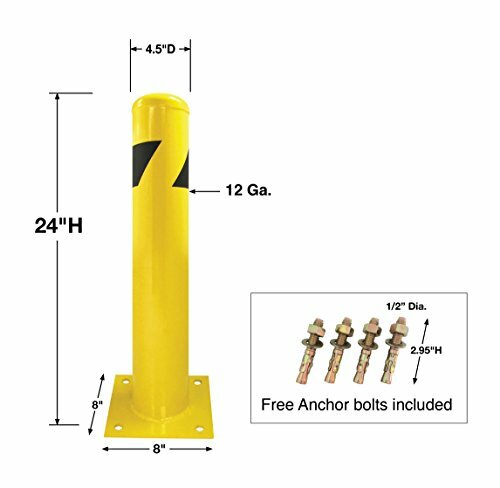 The safety bollard guard features an 8" x 8" mounting plate and mounting hardware is included. Great for protecting electrical panels, rack supports, gas pumps, fire hydrants, walls, and various areas that may be subjected to vehicle traffic. 24" Height x 4.5" Diam, 12Ga Steel, mounting base is 8 x 8"
Protect walls, equipment and machines from accidental damage in warehouses, parking lots, and work areas. 8 Net steel safety bollards provide a solid layer barrier between moving hazards and locations requiring protection designed to stop a vehicle and reduce damage to structures. Great for protecting electrical panels, rack supports, gas pumps, fire hydrants, walls, and various areas that may be subjected to vehicle traffic. View More In Machine Tool Safety Accessories. If you have any questions about this product by 8 Net, contact us by completing and submitting the form below. If you are looking for a specif part number, please include it with your message. 80/20 Inc., 1010, 10 Series, 1" x 1" T-Slotted Extrusion x 48"